Today has been a real bummer. After a few months without chemotherapy, last week the mumster went down to KLCC to have a blood test. The results are in today, her tumour markers have doubled. We're not too sure whether this will mean she'll have to start treatment again this week or whether we can hold off till next week. Whatever the case, she'll be tired and in pain again for the next several months. She'll be sick during her anniversary and Christmas. F.U.S. She has now been on treatment on and off for 10 years. I remember back in 1996 (or it could have been 1995) when I came out of school and she was there to walk us home. She said she had been to have an examination because she was a bit suspicious about a lump on her chest. And here we are in 2006 and it's still going. Sometimes it makes me upset, sometimes it makes me so angry I want to punch a hole through the drywall. 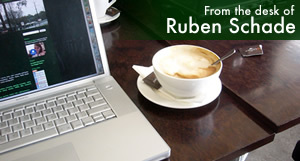 As for "The Desk", I've had a log on my machine since 1999 but now that I have been using WordPress on the Rubenerd Show and this blog for a fair while now I think it makes more sense to post them here. I'm not sure if I'll import the existing entries… that's roughly 365 per year (give or take a day or two I missed each month) since 1999… I'm not sure that would be so wise… information overload! Newer post ← LCARS 24 For Your PC!